Hello Quick Quotes friends! Wahooo it's Friday. Marcia here to host the blog today. I have another card to share that I made with the 6x6 Cracklin' Rose paper pad. I wanted to try out some new shabby techniques and thought a card would be a better means of experimenting versus a layout. This one is a sympathy card and will soon be on its way to a dear aunt unfortunately. I like having an extra sympathy card on hand 'just in case', so maybe I'll have to make a few more. The Cracklin Rose papers were perfect, with their muted colors. Are you going to be making some cards this weekend? Check out these new 6x6 paper pads either in the Quick Quotes store or over at Scrapbook.com! Marcia, this card is beautiful! 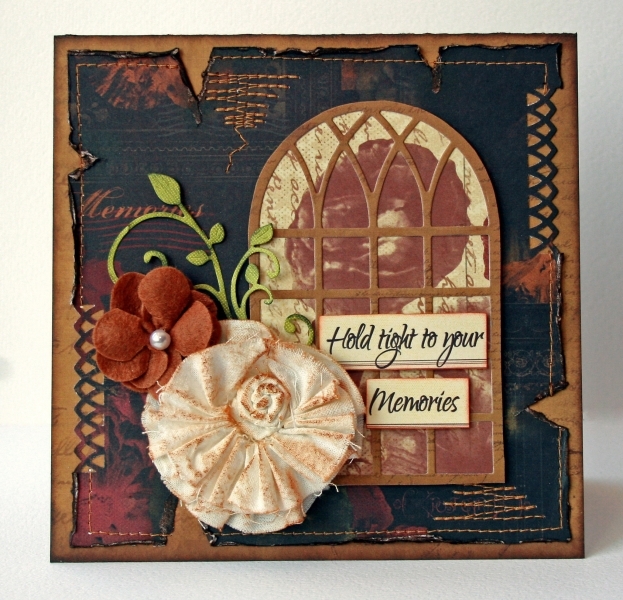 I love, love, love the chipboard window on this! Great card, I love how you used the chipboard window as well! Beautiful card, Marcia! Loving the distressed and punched edges.